It was a chilly, colorful morning as Friends of Grand Rapids Parks planted 10 trees in Cheseboro Park on Merritt Street SE. The little park recently lost all of its shade to the Emerald Ash Borer and thanks to Mayor George Heartwell’s Mayors’ Climate Protection Award, new Sawtooth Oaks and Red Maples were planted on Thursday, October 11. Students from Grand Valley State University’s pre-physical therapy program helped as well. 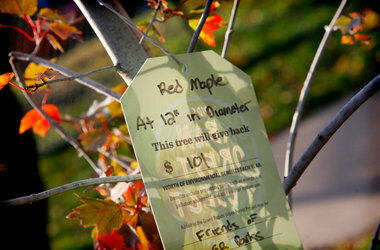 Friends of Grand Rapids Parks received half of the $25,000 award for urban tree planting. 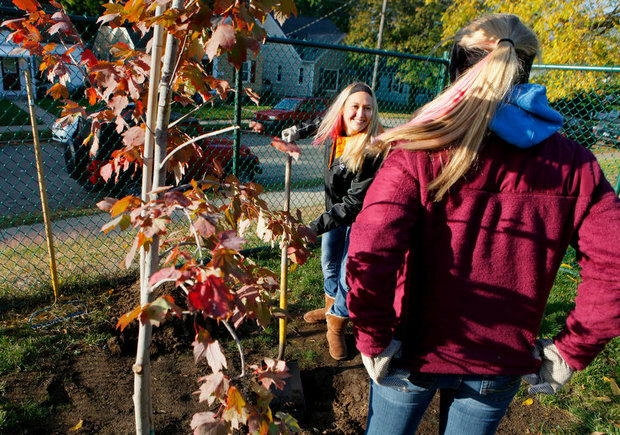 Including the trees at Cheseboro Park, Friends of Grand Rapids Parks will be working with volunteer groups throughout October to plant more than 50 trees through this award.